Top quinoa and grilled fish with a fresh nectarine salsa for a low-calorie dinner. Nectarines are bright, firm and full of juicy flavors this time of year. Enjoy one for a snack to include vitamin A and C in your diet. It is low in calories, and a medium-sized piece of this fruit has about 60 calories and 8 percent of your daily recommended value for niacin. As with most fruit, nectarines have a good amount of fiber. Fiber adds bulk to your diet and makes you feel fuller so ideally you eat less. 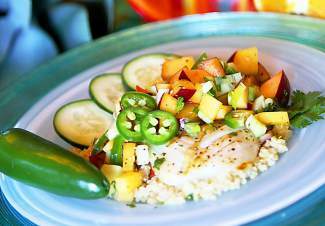 This recipe includes cod fillets, quinoa, nectarines, cucumbers, cilantro and jalapenos. It is packed with fresh flavor and the total calorie count for the meal, which includes a 6-ounce fillet of cod, 1 cup quinoa and 1/2 cup salsa, checks in right around 390 calories. Nectarines are stone fruit, like peaches and cherries, so it has a pit in the middle. The easiest way to cut this type of fruit is to take a sharp knife and follow the seam all the way around the pit. Then, take each half in your hand and twist. Remove the pit and you have two sides to cut into cubes or grill for a salad or dessert. This salsa is simple to assemble and can be served on fish, chicken or pork. To grill the fish, be sure to have your grill on a high heat and cook each side for a few minutes. It is so easy to overcook fish and many of us do that in fear that it will not be cooked through. Remember, when you remove the fish from the grill and let it rest, it will cook a little more. When you are flipping the fish, if it sticks to the grill, let it cook longer on that same side. All meat should slide onto your spatula easily when flipping a grilled item. If it doesn’t, cook it longer on that side and adjust cook time for the second side. No scraping pieces here. All the fiber in the salsa will help you feel full, while quinoa and fish are packed with protein. The quinoa cooks up rather quickly; be sure to rinse it well before cooking. Often times, I’ll cook extra quinoa and add it to my salads for a little more body. Cooked quinoa is good for about three days in your refrigerator, and you will be surprised how often you’ll eat it if it is already there. In a small ramekin, mix salt and pepper together. Cook quinoa according to package directions. Fluff with a fork when finished. To make salsa, cube nectarines and cucumbers, making the cubes of each about the same size, around 1/4-inch. Mix in the remaining ingredients. Stir and season to taste. Let it sit, stirring twice. Pat the fish dry with a paper towel and brush each side with olive oil, then season each side of the fish with salt and pepper. Place the fish on the hot grill and cook for 4 minutes on each side. Let fish rest 5 minutes before serving. Serve 1 cup quinoa and 1 fish fillet with a 1/2 cup salsa on top. Serves four people as main course. Tracy Miller includes fruits and vegetables in all her meals. Check out her recipes at http://www.Colorful Cooking.com. Join Miller for cooking classes at CMC in Edwards and Breckenridge or for private lessons and cooking parties at private residences. Contact her at Tracy@colorful cooking.com.